Paterson, NJ is a town rich in working class history. In the early part of the 20th Century it was one of the most important textile centers in the US. The 1913 Paterson Strike pitted 20,000 silk mill workers against the owners of 300 mills. The strike was lead by legendary radicals of the era, Elizabeth Gurley Flynn and Big Bill Haywood who were members of the IWW (Industrial Workers of the World). Come on out on Labor Day this year and March in solidarity with Verizon workers who are still fighting so working and middle class folks can attain a victory in what is fast becoming an era of big time labor defeats as bosses and their flunky politicians, emboldened by their terrorist victories around the world, try to squeeze the life blood from working people here in the US. 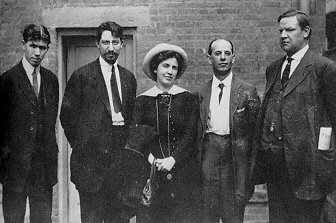 Strike leaders Patrick Quinlan, Carlo Tresca, Elizabeth Gurley Flynn, Adolph Lessig, and Bill Haywood.